"[Poetry] merely speaks to the soul, so the soul can remember. So it's quite proper to have all the poems against the war. And it's proper not to be disappointed if nothing changes." 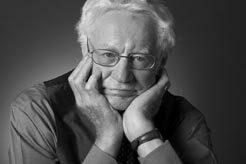 Born in western Minnesota in 1926, Robert Bly enlisted in the Navy when he was 18, where he spent two years, before attending Harvard and later the University of Iowa's Writer's Workshop. "It's quite proper to have...poems against war. And it's proper not to be disappointed if nothing changes," Bly explains to Bill Moyers. Bly has touched upon a wide range of topics in his more than 30 books, poetry volumes and translations, examining the power of myth, Indian poetry, meditation, and storytelling. His IRON JOHN: A BOOK ABOUT MEN, became an international bestseller, helping to bring more men into the world of poetry. Read an excerpt here. In 1990, Bly and Bill Moyers collaborated on the series, A GATHERING OF MEN, exploring the changing role of men in modern America. Watch the first 10 minutes of this program here. Recent books of poetry and prose include MY SENTENCE WAS A THOUSAND YEARS OF JOY, EATING THE HONEY OF WORDS, THE SIBLING SOCIETY, and KABIR: ECSTATIC POEMS. Robert Bly talked with Bill Moyers about his recent focus on Islamic poets, including Rumi, Hafez and Kabir. Bly states: "Rumi and Hafez have been the guiding light, Rumi especially, of American poetry for the last five or ten years. But also it seems to me that if we're ...criticizing the Muslim world so much, we should be able to give thanks for the genius that is there...So, this is Persian poetry-14th century. "The foods turned out by the factors of time and space are not all that great. Bring some wine because good things of this world are not all that great." 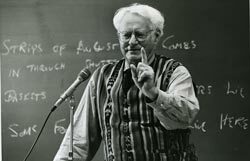 "At this web site, readers will find information on every facet of Robert Bly's literary career, including bibliographies, reviews, and interviews, as well as new essays, poems, and translations, to increase their understanding and enjoyment of Bly's work." "I am uneasy at a ceremony emphasizing our current high state of culture. Cultural prizes, traditionally, put writers to sleep, and even the public. But we don't want to be asleep any more." "Poet headed to Austin talks about Iraq war and the stupidity of watching TV 6-8 hours a day." "In an essay published in 1961, Robert Kelly coined the term "deep image" in reference to a new movement in American poetry. Ironically, the term grew in popularity despite the critical disapproval of it by the group's leading theorist and spokesperson, Robert Bly. Speaking with Ekbert Faas in 1974, Bly explains that the term deep image "suggests a geographical location in the psyche," rather than, as Bly prefers, a notion of the poetic image which involves psychic energy and movement." "The Walt Whitman Archive is an electronic research and teaching tool that sets out to make Whitman's vast work, for the first time, easily and conveniently accessible to scholars, students, and general readers." Biography and links to Whitman's writings. Whitman is featured in this PBS documentary about the singing tradition in America. Writer Stephen Mitchell has translated many of Rilke's writings. You can read his commentaries on LETTERS TO A YOUNG POET and his translations of some of Rilke's verse online. Biography and links to Rilke's writings. An extensive collection of Rilke's writings. The complete text of the book: "You ask whether your verses are any good. You ask me. You have asked others before this. You send them to magazines. You compare them with other poems, and you are upset when certain editors reject your work. Now (since you have said you want my advice) I beg you to stop doing that sort of thing. You are looking outside, and that is what you should most avoid right now. No one can advise or help you - no one. There is only one thing you should do. Go into yourself. Find out the reason that commands you to write; see whether it has spread its roots into the very depths of your heart; confess to yourself whether you would have to die if you were forbidden to write." "Rumi.net is based on the work of award-winning Rumi translator, author and performer Shahram Shiva. Shiva has been translating the poetry of Rumi since 1988 and has been presenting Rumi concerts and workshops in the US ever since." "There has long been a great tradition of spiritual poetry in the world of Islam. From the time of the Blessed Prophet Muhammad, when his companions used to recite poetry with his approval, until our present day, Muslims have sought to discover the truth of the maxim, 'In some poetry there is wisdom.'" Nafas, in Middle-Eastern languages, is the word for "breath" and a metaphor for spirit or life. Texas Nafas airs on Public Access Community Television (PACT, Time Warner Cable channel 16, every Saturday at 10:00 PM to 10:30 PM in Austin, Texas). In August 2007, Robert Bly and Coleman Barks read poems in a special program sponsored by Nafas. Talk about economic and employment issues on the blog.